Actress Anushka at Kalamandir Showroom Photos wearing an sico orange uppada silk saree. Embellished with weaved zari around the saree, followed by heavy pallu and blouse designed with quarter sleeves and round neck blouse. South Indian actress Anushka in beautiful maroon designer georgette saree with gold embroidered border at an event. Paired with designer embroidered short sleeves saree blouse with round neck pattern. South Indian actress Anushka in beautiful green and pink designer half saree. Multicolor embellished with patch work through out the green border,followed by grey plain border. It is a pink plain georgette dupatta with double border. It is paired with designer short sleeves saree blouse. South Indian actress Anushka in beautiful orange and pink combination designer uppada silk saree at Kalamandir Show Room Launch. Zari woven rich border in pink back ground self zari work embellished throughout. Paired with designer 3/4th sleeves silk saree blouse with round neck pattern. Checkout South Indian actress Anushka Latest Saree and Half Saree Collection. 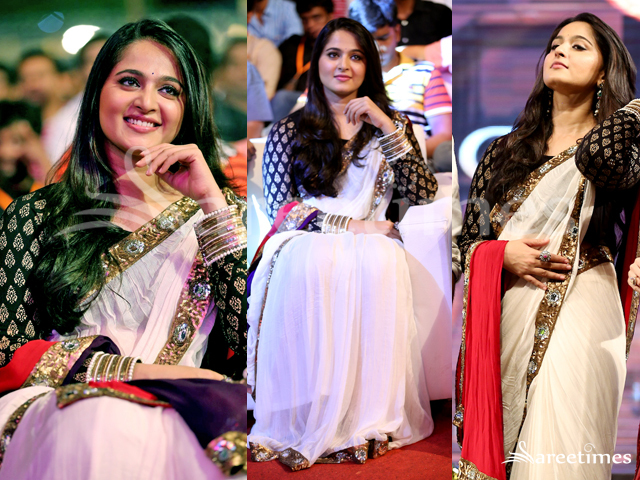 South Indian actress Anushka in beautiful designer half and half saree. Designed by Sabyasachi at Varna Audio Release. It is gold and black colors combination party wear saree with Georgette and velvet materials. Georgette plates with silver work brasso chips and antique rich border, Black velvet pallu embellished with embroidered rich rose floral work. Paired with black designer velvet short sleeves saree blouse with round neck pattern. South Indian actress Anushka in beautiful blue designer dual color georgette saree. It is a plain saree. It is paired with matching short sleeves saree blouse with round neck pattern. South Indian actress Anushka in beautiful blue designer saree. Silver embellished work all over saree. It is paired with matching designer sleeveless saree blouse for back. South Indian actress Anushka in beautiful cream and black designer dual color georgette saree.Border is highlighted with beautiful thread work zigzag border.Gold embellished zari work across the red followed border.It is paired with red designer 3/4th saree blouse with round neck pattern.Raw silk fabric and similar border on the sleeves at ‘Mirchi’ Audio Release Event. South Indian actress Anushka in beautiful black designer net saree with thread work all over saree and embellished with patch work border paired with designer halter neck saree blouse. South Indian actress Anushka in beautiful brown and mustard designer half saree with yellow self thread and brocade work borer. gold and brown color shimmering fancy borders outlines paired with designer short sleeves saree blouse. South Indian actress Anushka in beautiful white designer wet saree in chiffon fabric with lace border, sequins buttes on it.It is paired with designer short sleeves saree blouse with ‘V’ shape neck pattern. South Indian actress Anushka in beautiful designer halter neck and embroidered short sleeves saree blouse. South Indian actress Anushka in beautiful green designer dual color georgette saree with printed work paired with designer spaghetti strap saree blouse.